Shane Carwin (right) wants another piece of Brock Lesnar. A few weeks don’t go by before there’s some headline out there about Brock Lesnar potentially returning to the UFC. And the man who nearly defeated him for the UFC heavyweight title hopes they’re all true — he would love to be his return opponent. Shane Carwin told FOX Sports that he would come out of retirement if it meant another chance at Lesnar. Carwin stepped away from the UFC last year due to injuries, mainly a chronically hurt back. Lesnar, meanwhile, is the WWE world heavyweight champion. "I’m all in," Carwin said of a potential rematch. "All the pain would be worth that." Carwin, 39, is happy in retirement, working as an engineer, raising his two kids and co-owning regional MMA promotion Prize Fighting Championships. But the chance to meet Lesnar again in the Octagon would be too good for him to pass up. Carwin almost finished Lesnar in the first round of their title fight at UFC 116 in 2010. Lesnar was bloody and badly hurt. He took a ton of punishment from Carwin, but referee Josh Rosenthal never stopped the fight. 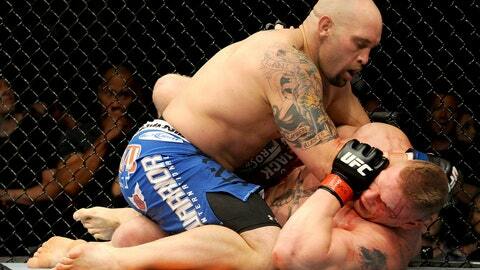 Lesnar survived and came back in the second round to submit Carwin with an arm triangle on the ground. By that time, Carwin was beyond gassed, having put every ounce of his energy into trying to stop the fight in the first. "I basically almost died in that fight," Carwin said. "In the second round, anybody could have tripped me and landed on me." I basically almost died in that fight. In the second round, anybody could have tripped me and landed on me. The course of UFC history would have changed had Carwin won the title. Three months later, Lesnar dropped the belt to Cain Velasquez. He then took time off to deal with a relapse of diverticulitis before coming back to lose to Alistair Overeem in December 2011. Lesnar retired afterward. Carwin fought only once more after falling to Lesnar, a unanimous decision loss to Junior dos Santos in June 2011. Ironically, Carwin replaced Lesnar in that fight against dos Santos when Lesnar got sick. Dos Santos and Lesnar had coached opposite each other on "The Ultimate Fighter" that season. Carwin sees a rematch between him and Lesnar going much the same way as the first right — except he would stay standing and continue the onslaught rather than burn his energy on the ground. "I should have let him up and kept punching him in the head," Carwin said. "Lesson learned. Cain learned it. If I didn’t make it obvious what to do to that guy, the next guy did." Shane Carwin (left) laid a pretty good beating on Brock Lesnar in July 2010 at UFC 116. Carwin said he doesn’t think about that fight often, but it crosses his mind enough for him to remember his gaffe. As much as Carwin wants a do-over, he doesn’t expect Lesnar to return. "He’s not coming back," Carwin said. "I don’t even know why he would have the desire." Lesnar’s good friend and WWE on-air advocate Paul Heyman said over the summer that Lesnar still watches the UFC from time to time and believes he could beat anyone in the heavyweight division. Heyman maintains that Lesnar was never completely healthy during his MMA run due to diverticulitis. Earlier this month, former WWE play-by-play man Jim Ross told FOX Sports that Lesnar’s contract with WWE is likely up in March or April. Could that mean a UFC return? It’s only a matter of time before those headlines start popping up again. While there’s little doubt Lesnar would be a draw again — he was the biggest in UFC history — Carwin doesn’t think he would be effective. "He’s not going to improve the part of his game he needs to improve in that short (amount) of time," Carwin said. "The guys these days are too far ahead. You can’t be one-dimensional. This isn’t the early ’90s." No, it isn’t. But Carwin wouldn’t mind rewinding to 2010.